Gotta love the occasional typo on the selvedge! I sewed this outfit a few weeks ago and only because I took these pics in over 100 degree heat, I will share them. I didn’t want to! I used 2 3/4 yards of this awesome 100 % cotton Exploding Tardis fabric that I purchased on sale from Joann. The pattern is the same one I use for all of my circle skirts but always fail to mention it. My awesome husband drafted it for me over 2 years ago! He’s great. I’m very pleased with the hem. Now let’s talk about that AWFUL top. I’ve made one Moneta so far and this top was originally going to be a dress. I had lots of issues with the fabric being too thick (cotton interlock, MY BAD) so the gathers on the skirt looked atrocious and pleats looked even worse! I don’t even want to get started on that neckline. I will always show my projects, good and bad but this is kind of embarrassing for me. Oh well. Until next next time, Happy Stitching! Tardis skirt………..awesome!!!!!!!!!!! 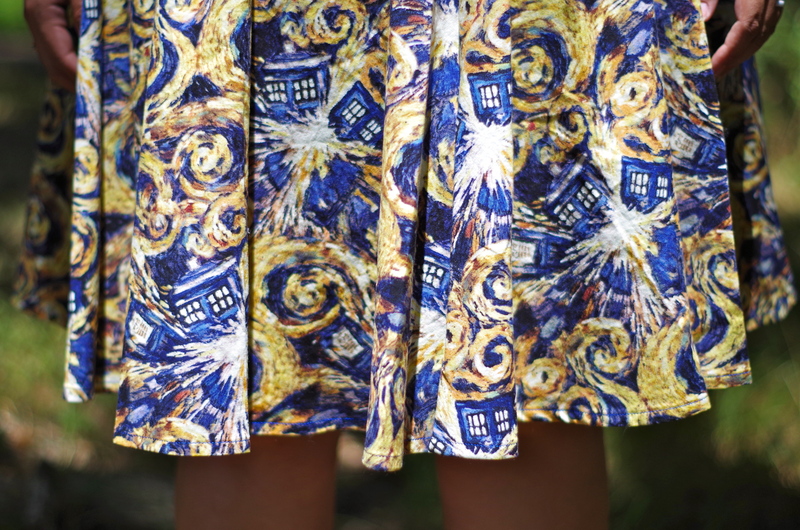 Wibbly Wobbly Timey Wimey skirt. (whispers) I think the top looks just fine……. Thanks! I always try and play it safe with knits but I saw the interlock and hoped it would work for me. It’ll go in the “never again” pile haha. I think I’m just going to use my old TNT Gertie knit pattern for a cropped navy top. Yeah, the top isn’t so bad! I love the skirt. Thank you! I’m too much of a perfectionist unfortunately, lol.